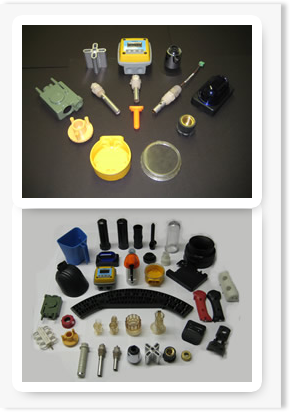 Heat Insertion is a user friendly, low maintenance, repeatable method of permanently embedding a metal component into a thermoplastic product through the use of precise time, temperature, and pressure. The most common example of heat insertion applies to internally threaded metal fasteners (inserts). The insert O.D. is manufactured with various knurls, teeth, grooves and undercuts which are designed to accommodate displaced plastic to prevent rotational torque or tensile pull out. A manual or pneumatic press has heated probes with a tapped face to accept various size insertion tips. The insertion tip is designed to rest on the top surface of the insert as well as piloting down into the internal thread. Once contact is made moderate force is applied to the insert. 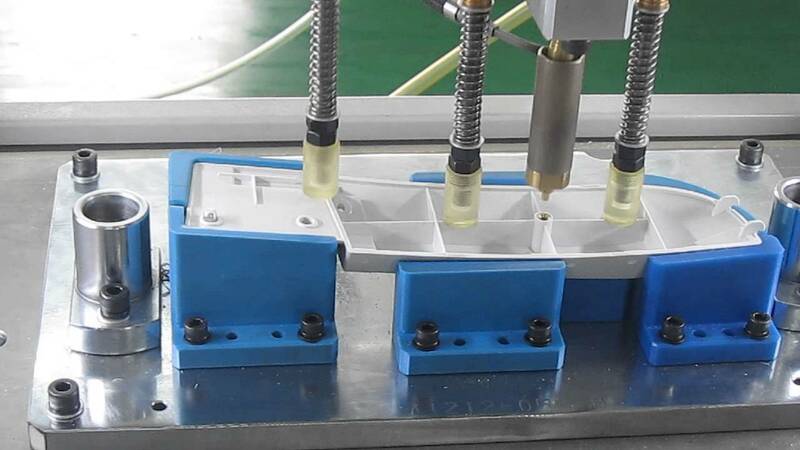 The pressure for force being applied to the insert is set so that it cannot "cold press" into the part. Heated via thermal conduction the insert does not begin to install into its mating hole until it reaches the melt point of the thermoplastic material. Once the proper melt point has been achieved the heated probe advances and drives the insert to a flush or above/below flush specification. The insert does not begin to install into its mating hole until it reaches the melt point of the thermoplastic material. Once the proper melt point has been achieved the heated probe advances and drives the insert to a flush or above/below flush specification. Heat insertion achieves the high strength values of a molded in insert while offering the benefits of post molded insertion. Heat insertion allows the fabricator to install an unlimited number of inserts of various sizes on multiple planes simultaneously. Heat Staking is also a user friendly, low maintenance, cost effective, repeatable method of mechanically attaching plastic to plastic and plastic to non-plastic products. The process combines precise pressure, temperature, time and cooling to reform a plastic stud, tab, wall, or protrusion over a mating component to retain or mechanically lock it in place. Generally, the mating component is a dissimilar product such as printed circuit boards, metal brackets or stampings, bezels, light pipes, RF shields, or non-compatible plastic resins. Physically and visually the heat staked assembly appears to be an extension of the molding or fabricating process. A manual or pneumatic press has heated probes with a tapped face to accept interchangeable process tips. The tip is manufactured with various contours, conical cavities, knurled patterns, or specific profiles. Once heated via thermal conduction, the tip is used to melt, form, and solidify the plastic stud which protrudes through a hole in the mating component. The molten stud under heat and pressure compresses and takes the shape of the tip cavity. At this point our unique "freeze out" feature rapidly cools the tip and solidifies the plastic under clamping pressure. This ensures a tight assembly and excellent tool release from the plastic which prevents sticking or stringing on the forming tool. Until recently, the majority of staking was done with ultrasonic welding. With today's sophisticated microprocessor based temperature controllers, precision dwell timers, and other combined technologies, heat staking offers many advantages, such as the ability to simultaneously perform many stakes on varying planes of a product as well as independently control each staking point.